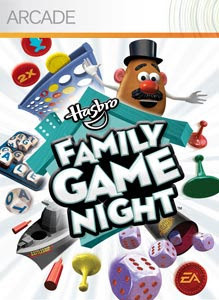 The Arcade game for this week XBLA title is Hasbro Family Game Night. If you want to buy or check out the trials, you must first download the free Hasbro Family Game Night game room and then select the games you wish to trial or buy. Each game will cost 800 Microsoft Points ($10.00 U.S.D). "HASBRO FAMILY GAME NIGHT is now available on Xbox LIVE with all new online play for up to 4 players on Xbox LIVE Multiplayer! Featuring seven downloadable games including: BATTLESHIP, YAHTZEE, BOGGLE, CONNECT FOUR, SCRABBLE, SORRY! and the all new, SORRY! Sliders, HASBRO FAMILY GAME NIGHT has something for everyone! Join your host MR. POTATO HEAD for fun and games with family and friends like never before. Enjoy familiar original Hasbro board games or throw in a fun spin with new versions like CONNECT FOUR Power Chips, BOGGLE Portal Cubes, Reverse YAHTZEE and BATTLESHIP Super Weapons – which add fresh dimensions and challenges to these legendary favourites!"